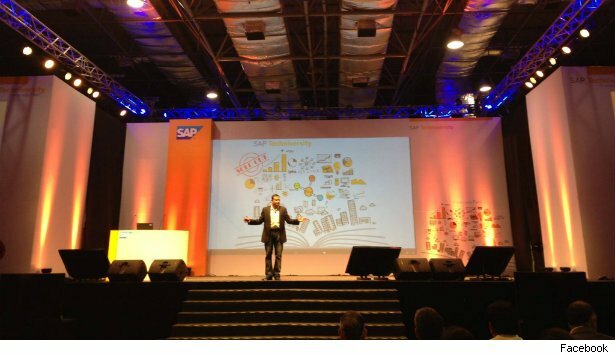 The second edition of SAP Techniversity, the technology event hosted by SAP India Labs, saw an enthusiastic participation by about 5,500 students from approximately 300 colleges and unversities of India here on Saturday. The day-long event saw speakers from SAP Labs India and the company's Germany headquarters speaking on opportunities for students not only in the company but also the support they can expect for their entreprenurial forays. The managing director of SAP Labs India, Anirban Dey said that the idea behind the event was to reach out to students even before they leave college. "It's simple, we want to make students get a feel of the real world. It's also to enable them get insights on new technology solutions happening globally," he said. He added that such events also give young minds a chance to showcase winning ideas to existing or prospective clients. On SAP's HANA platform that helps accelerate analytics, business processes, sentiment data processing, and predictive capabilities, Dey said that about 800 start-ups across 55 countries have built solutions using HANA. SAP has a dedicted HANA Realtime Fund for $500 million, which is in the nature of venture capital funding. There are three applications currently in pilot mode in India using HANA, Dey said. The former chairman of Microsoft India, Ravi Venkatesan in his brief speech perked up the audience with his pep talk, often delving into his stints in various Indian and foreign companies. "My story is one of optimism, I did what my heart asked me to do," he said, explaining why he returned from the US to join Tata Cummins in India in 1996, when it was not doing well. "I was young and foolish to join a business that was about to close." He said that his decision to join Microsoft in 2004 and quit in 2012 was also an instance of not being influenced by advice that came from friends. Venkatesan's advice for budding entrepreneurs was simple. "You should have the courage to take risks and never give up." He also touched upon the scourge of Indian politics, of many politicians facing criminal charges and dominance of dynasty politics. "Politics is degenerating into family-run criminal enterprise." On the recent controversy triggerred by the Central government's attempt to overturn a Supreme Court judgment that mandates disqualification of lawmakers convicted for a criminal offence, by moving a ordinance, Venkatesan said, "Does it get any more brazen than this?"